Earlier this year the Metal Store ran a contest looking for Metal Masterpieces. I had a chance to talk to the winner Nick Wysoczanskyj. 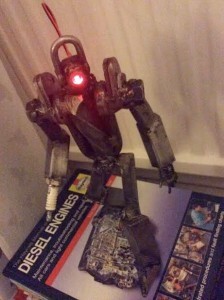 His Iron Bloke sculpture made from is made from scrap metal with a glowing LED eye. Nick is a freelance scenic artist and works on Tv and film sets as well as being a trained illustrator. Workshopshed: Nick, congratulations on winning The Metal Store Metal Masterpiece competition and thank you for being interviewed. 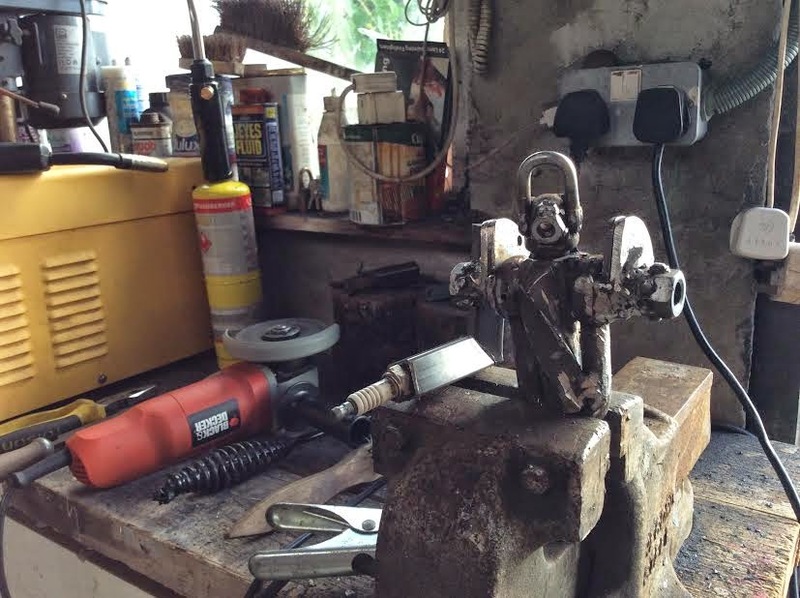 Workshopshed: What inspired you to make Iron Bloke? Workshopshed: What did you use to make him? Nick: I have a small, very basic workshop at home. Iron Bloke, was built there, in the evenings after work. We have an ancient double garage at the back of the house, that doubles as a shed. I have a bench, with a good vice and a drill press, set up in there. The nature of my work, dictates that I have a good range of basic power and hand tools, for working with a range of materials. In terms of welding equipment I have a 130 amp gasless MIG welder and a small 100 amp stick welder. Most of my metalwork is done with a grinder, a simple rotary tool for more detailed work, and a range of vices, clamps, and files. A good cross slide vice, and some milling bits, give me a really primitive machining capability at a small scale, but most of what I make is simply hand ground, and welded up. 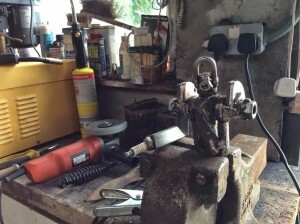 Workshopshed: Where did you learn metalwork? Nick: I started learning basic fabrication skills, in wood, plastics, and a limited amount of metal fabrication, but not as much as I would have liked, at school. My family also work in various construction trades, so there was always a lot of practical knowhow around growing up, and I often worked with them, on site, for pocket money. It was this background in general building work that got me through university, financially speaking. After leaving school I studied product design for two years, and enjoyed the run of my college’s, very well equipped workshops. I changed direction a little after that and studied for a BA in Illustration. Workshopshed: How did you get from Illustrations to Sets? Nick: My university had a broad definition of illustration, as well as a well equipped shop set-up; which I took full advantage of, undertaking sculpture based work along side my hand drawn projects. My work these days is a strange mishmash of my general building work background and my art and design training, drawing on the fabrication skills, large scale construction knowhow, and the more creative storytelling skills of my Illustration background. I enjoy that fact that I’ve managed to find a use for my eclectic skills, which is also an environment where I can continue to challenge them, expand on them, and learn new things along the way. Workshopshed: Yes, I can see that would prepare you nicely for your work. Nick: Professionally, as well as working as a scenic painter, I also work as a scenic carver, set dresser (installing the final fixtures and fittings to ‘dress’ the set), I do some props fabrication and repair work, and I also work in the ‘standby’ roles for those positions, with the shooting crew, from time to time. I have to work with a very wide range of materials, wood, metal, plastics, foam, plaster, fabrics, and various paints and finishes, and this has lead me to a fairly broad skill set, and an extensive tool kit. Workshopshed: Do you use a lot of metal in set design? Nick: Metalwork is often a big feature of props fabrication and on set as railing, grills, grates, gates, hinges, fixtures, fittings – the list goes on and on. However, on Da Vinci’s Demons – the show that I currently work on most of the time – we have an excellent, dedicated metalwork team and props fabrication department. I don’t get to do much metal fabrication work on that show, mainly in a set finishing role making, small alteration for artistic reasons, or for “fit” around other bits of the set that may be added long after the bulk of the metalwork was designed and fabricated, but they do, very kindly, let me dig through their scraps bins, and are a great source of materials for me. Workshopshed: What next, has this success driven you to create more? 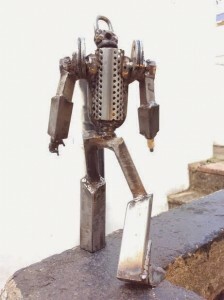 Workshopshed: A big thanks to Nick and his excellent Iron Man, and also to The Metal Store for putting on the Metal Masterpiece competition. Ha..Ha.. Really amazing to read this post. Thanks for sharing such an interesting post with us.